It’s been a while but I felt compelled to come back and write a post. For the longest time, I’ve been making friends within the Michael Jackson fan community and it’s been awesome to connect with people that understand me. As you guys know, I have been pouring lots of energy into Youtube and I posted my video diary from the days events on my channel last week. It was really cool to see how many views it got in the first few days! One of the things I love the most about parties in honor of Michael is seeing how many people still love and are passionate about him and his music. 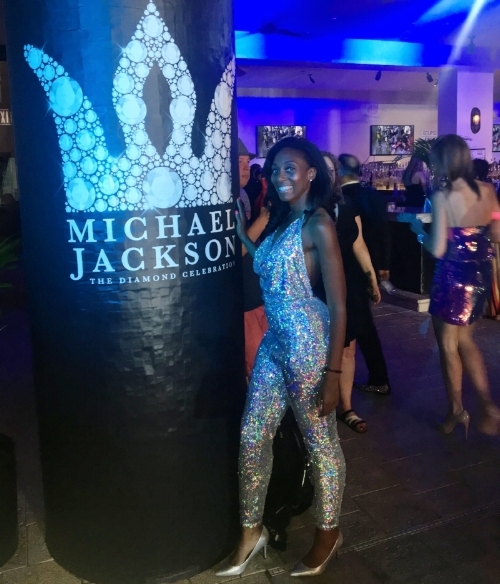 At the Diamond Celebration, we had the honor of hearing a few people close to Michael speak, including Prince and Paris Jackson, Usher, The Elizabeth Taylor AIDS foundation, and Tito Jackson. Tito came on stage at one point and shared that he thinks Michael is smiling down on the party and he thanked everyone for loving his brother. That moment brought tears to my eyes. I think so often as fans, we tend to think about Michael as this persona, this far out of reach celebrity and not really as a person. Hearing Tito speak from the heart about his brother truly touched me and made me realize how amazing it is to have thousands still gathering for Michael’s birthday. It’s been almost ten years without him here on Earth and I have to be honest… it just doesn’t feel like it to me. I guess that’s a good thing though. Michael spoke so often about his music really being the thing to outlast him and that his legacy would live on through his art. I know that is exactly what’s happening now and I’m so happy to see his fan base ever growing and ever changing.